I am so thankful for the labor of love from those who make up the church I have the privilege of pastoring. This article was carried in the local paper today. A vivid reminder that we have a full days work ahead of us tomorrow. MANTUA TWP. — Approximately 600 victims of Hurricane Sandy will have food for Thanksgiving, thanks to a church in Sewell that mobilized to help a coastal town in Ocean County. Volunteers and pastors from Fellowship Bible Church have been gathering 50 turkeys, 90 pounds of ham, and hundreds of pounds of vegetables and side dishes in anticipation of transporting the feast to Brick Township on Thursday morning, where it will be distributed at the local Veterans of Foreign Wars (VFW) hall. “After Sandy hit, we at Fellowship Bible Church split into six teams — for prayer, collection, distribution, cleanup, rebuilding and Thanksgiving and Christmas teams — and soon we were getting trucks and trailers in donations,” said Pastor Phil Moser. In addition to storm victims, volunteers will be serving roughly 140 New Jersey National Guard troops spending the holiday away from their family while helping out in areas damaged by Sandy. 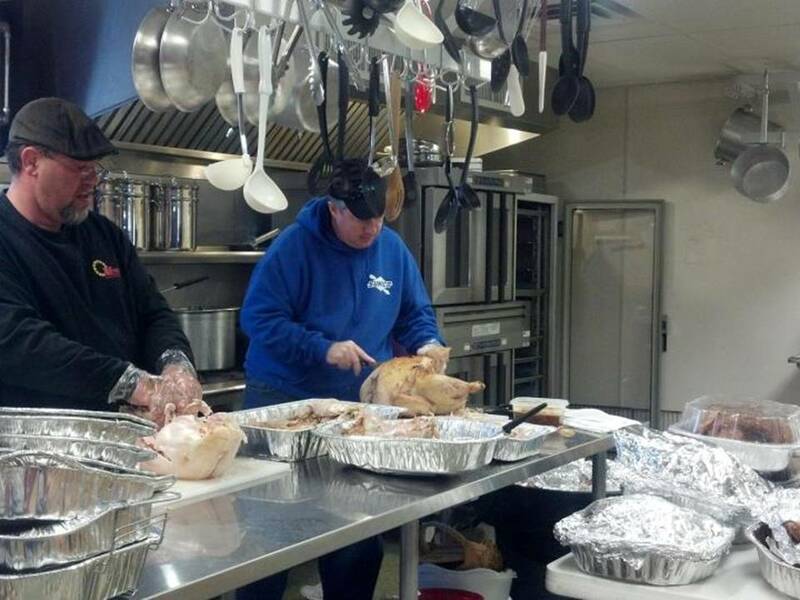 According to Moser, the 50 turkeys were cooked at the Sewell church Tuesday and will be carved today. Also set to make the trek to Brick will be 240 pounds of carrots, 120 cans of turkey broth, 12 five-pound bags of potatoes already boiled and mashed, 70 boxes of stuffing, 40 pounds of elbow macaroni, 67 10-oz. cans of cream of mushroom soup, 140 bags of green beans, 500 cans of turkey gravy, and 250 cans of cranberry sauce. “Once Hurricane Sandy came, Fellowship Bible Church just began sending us truck-loads of stuff — from water to cleaning supplies,” said Peterson. “There’s a real special relationship that has been built here, and I think they understand part of the real meaning of Christianity — serving the community. This entry was posted in Thanksgiving and tagged church in sewell, Fellowship Bible Church, hurricane Sandy victims, Thanksgiving.